Vadapalani Andavar Temple is a Hindu temple dedicated to Lord Muruga. It is located in Vadapalani, Chennai. The Vadapalani temple was built in late 19th century. It all began with Annasamy Naicker , a staunch devotee who with faith in the lord’s powers built a small thatched hut, placed a painted picture of Lord Murugan and began worshipping it religiously everyday. It was renovated in the 1920s and a Rajagopuram was built during that time. The temple has grown in popularity, which is believed to be in part due to the patronage of cinema stars. According to the sthalapurana, Muruga devotee Annaswami Nayakar built the shed and kept a Murugan painting there for his personal worship. During his worship, he experienced divine power entering his body and inspiring him to speak surprising things later found to be true. His utterances were labeled 'arul vakku' ('God blessed statements') and could cure diseases, provide jobs, solemnize marriages and more. Many sannidhis are present in the temple courtyards, including Varasiddhi Vinayaka, Chokkanāthar (Lord Shiva), Meenakshi Amman, Kāli, Bhairava, Shanmuga with Valli and Devasenā. The moolavar in standing posture resembles Palani Murugan. In the inner prakara, many niches house Dakshina Murti, Chandikeswar, Mahalakshmi, and others. It has a spacious hall used for marriages and religious discourse. It is one of the most-frequented Murugan shrines in Chennai. The entrance to this temple is crowned with a Rajagopuram adorned with several stucco images depicting legends from the Skanda Purana. In front of the temple is the temple tank. The eastern tower rises to a height of 40.8 metres. The 108 bharata natyam dance gestures can be seen on the eastern tower. ^ Subburaj, V (1 December 2006). 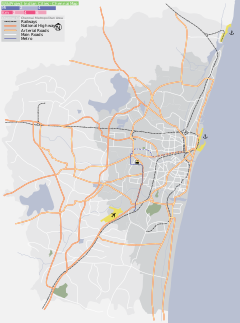 Tourist Guide to Chennai. Sura Books. pp. 14–. ISBN 978-81-7478-040-9. ^ King, Anthony D. (1984). Buildings and Society: Essays on the Social Development of the Built Environment. Routledge & Kegan Paul. pp. 143–. ISBN 978-0-7102-0234-5. Wikimedia Commons has media related to Vadapalani Andavar Temple.